We recently held the annual toy "Techs for Tots" toy drive collecting new toy donations from our generous community members. 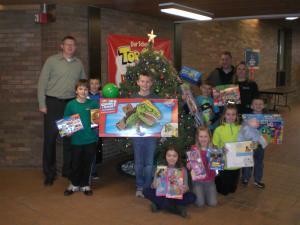 The toy drive was very successful and toys were shared at the Spirit Lake Elementary School and Upper Des Moines of Spirit Lake. Comfortec is honored to be part of helping to ensure that as many children as possible have a new toy to open during the holidays. We are fortunate to work in a community with such generous businesses! Thank you to all the public for their donations to make this all possible! We recently held the annual "Techs for Tots" toy drive collecting new toy donations from our generous community members. The toy drive was very successful and toys were shared at Estherville Lincoln Central and Upper Des Moines of Estherville. Comfortec is honored to be part of helping to ensure that as many children as possible have a new toy to open during the holidays. Thank you to all the public for their donations to make this all possible! We recently held the annual toy "Techs for Tots" toy drive collecting new toy donations from our generous community members. The toy drive was very successful and toys were shared at the Spirit Lake Elementary School and Upper Des Moines of Spirit Lake. Comfortec is honored to be part of helping to ensure that as many children as possible have a new toy to open during the holidays. A HUGE thanks to participating Spirit Lake businesses that were drop off locations: Central Bank and Lakes Regional Healthcare. We are fortunate to work in a community with such generous businesses! Thank you to all the public for their donations to make this all possible! We recently held the annual "Techs for Tots" toy drive collecting new toy donations from our generous community members. The toy drive was very successful and toys were shared at Estherville Lincoln Central and Upper Des Moines of Estherville. Comfortec is honored to be part of helping to ensure that as many children as possible have a new toy to open during the holidays. A HUGE thanks to participating Estherville businesses that were drop off locations: Bank Plus and Jensen's Furniture Store. We are fortunate to work in a community with such generous businesses! Thank you to all the public for their donations to make this all possible! The winner of the Sweet Corn Days TV drawing is Marcia Morphew! Thanks to all who participated and be on the lookout for more chances to win some great items coming soon! 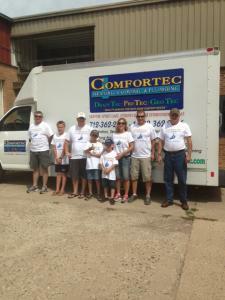 Comfortec held the annual FREE furnace giveaway by accepting numerous nominations for families in need of a new furnace. All were reviewed and the Brenner Family of Wallingford was chosen as this year’s recipients. The Brenner's were nominated by their neighbors and were very humbled to receive this new furnace. Once again all of us at Comfortec felt honored to help out and find it very rewarding to give back to our community members. We look forward to this giveaway every year! In the photo from left to right are Jesse and Brenda Jones, Nathan and Daisy Brenner and family. 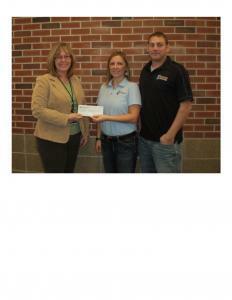 Comfortec Heating, Cooling & Plumbing recently held their annual "Plumbers In Pink" fundraiser. The technicians wore pink shirts with the pink ribbon out on service calls and donated 20% of all sales during a week period in October 2012. In Estherville Angie Olson accepted $2500.00 on behalf of Avera Holy Family to use the donation toward the Emmet County Wig Bank. In Spirit Lake Jennifer Gustafson accepted $2500.00 on behalf of Lakes Regional Healthcare to use the donation toward items for the chemotherapy room and patients in need. The $5000.00 will all be used locally in both communities to help people in need at home. 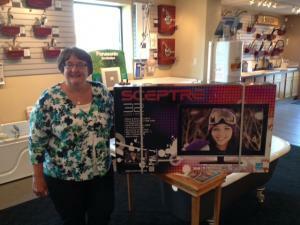 It is a great fundraiser and opportunity for Comfortec to raise money and cancer awareness at home. Comfortec is honored to give back and is looking forward to helping again next year. We recently held the annual "Techs for Tots" toy drive collecting new toy donations from our generous community members. The toy drive was very successful and toys were shared at Estherville Lincoln Central and Upper Des Moines of Estherville. Comfortec is honored to be part of helping to ensure that as many children as possible have a new toy to open during the holidays. A HUGE thanks to participating Estherville businesses that were drop off locations: Bank Plus, Jensen's Furniture, Fareway, and ALCO. We are fortunate to work in a community with such generous businesses! Thank you to all the public for their donations to make this all possible! We recently held the annual toy "Techs for Tots" toy drive collecting new toy donations from our generous community members. The toy drive was very successful and toys were shared at the Spirit Lake Elementary School and Upper Des Moines of Spirit Lake. Comfortec is honored to be part of helping to ensure that as many children as possible have a new toy to open during the holidays. A HUGE thanks to participating Spirit Lake businesses that were drop off locations: Central Bank, Carlson-Sanderson Real Estate, Wal Mart, and Lakes Regional Healthcare. We are fortunate to work in a community with such generous businesses! Thank you to all the public for their donations to make this all possible!